Just got this from Kimi. Condura Run organizers has just posted the result of 5k run last Sunday morning at The Fort. 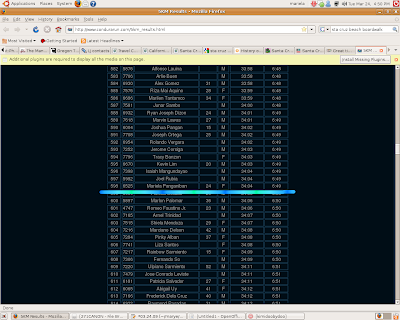 Finished at number 598 with 34:04 record. Not sure if this or my Yabang Pinoy result was better. Either way, wala lang haha. congrats sa run! :P sayang hindi ako nakasama..